This dish is so tasty. It’s surprisingly easy and doesn’t take very long to make. Plus the kids love it. 1) Heat 3tbsp of olive oil in a pot. 2) Finely chop the onion and 1 clove of garlic and soften in the pot for about 4-5 mins. 3) Add the mince and stir and cook until all the mince is brown and all the fat is cooked off. 4) Add your tomato puree to the mince and stir. 5) Add salt and pepper. 7) Add the oregano, basil, parsley, chili flakes, splash of Worcester sauce and paprika. 8) Stir, reduce heat to a med to low heat and leave to simmer for 20-25 mins stirring occasionally. 9) Place the sweet potato, remaining olive oil garlic cloves and a sprinkle of salt in a roasting dish. Give it a mix around. 11) Boil Your rice and everything should be ready around the same time. 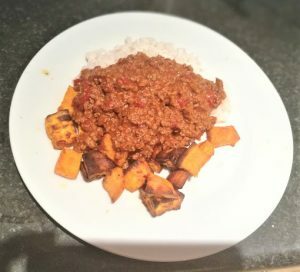 12) Serve all 3 together or just the chili and rice or just the chili and sweet potato and some in our house like it with grated melted cheese on top. Push Ups and What Else? 5 top Tips To Shed Pounds This New Year. © Unlimitedfitness. All Rights Reserved.